Action from Deeping's 4-1 win at Yaxley (blue). Photo: David Lowndes. Deeping Rangers are hoping their fantastic run of form will catapult them into second place in the United Counties Premier Division tonight (November 22). Deeping, unbeaten in their last 13 top-flight matches, host Sleaford Town at the Haydon Whittam Stadium (7.45pm kick off) and they go second with a win, plus a favour from the team they thumped 4-1 on Saturday (November 19). An aerial duel frem Deeping Rangers' win at Yaxley. Photo: David Lowndes. Yaxley were torn apart by Deeping at the weekend, but they have a chance to make amends when second-placed Eynesbury visit In2itive Park. Eynesbury have slipped off the scorching pace set by leaders Peterborough Sports, but they are a point ahead of Deeping going into tonight’s matches. 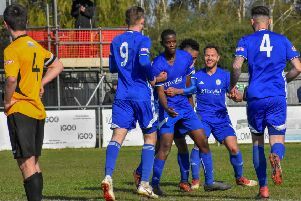 Sports, who have an eight-point lead at the top and who are now the top step five scorers in the country (75 goals) after their 7-0 weekend win at Wellingborough, have a tricky game at fourth-placed Holbeach United tomorrow (November 23). The Tigers lost manager Tom Roberts to work commitments last weekend. Roberts leaves Holbeach in the quarter-finals of the UCL Cup and the Lincs Senior Trophy as well as high up the league. Roberts’ number two Martyn Cundy is the favourite to step up, if he wants the job. Stamford AFC are in Northern League Cup action tonight at Lincoln United, the team that beat them in the Lincs Senior Cup Final. League Cup: Lincoln Utd v Stamford AFC. Premier Division: Deeping Rangers v Sleaford Town, Yaxley v Eynesbury Rovers. Premier Division: Holbeach United v Peterborough Sports. Hinchingbrooke Cup First Round: Huntingdon Town v Raunds Town.